Waterpik is a company that sells a small assortment of products including showerheads, water flossers, sonic toothbrushes and neti pots. From an energy reduction standpoint we’re going to focus on their showerheads. Waterpik has a line of EcoFlow showerheads that can save you some water, and with showers that is hot water that you’ve spent lot of energy heating up. 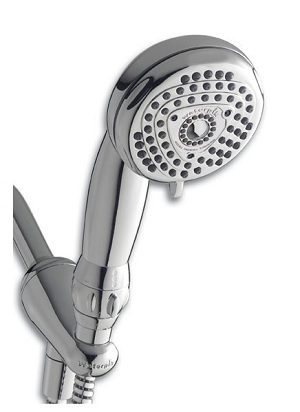 They offer most of the showerheads with a fix head or in a hand held version. All of the heads they offer have multiple spray settings, and some have as many as seven settings. For the giveaway, we have Waterpik’s ECO-563 (hand held) and ECO-533 (fixed head) to offer. These showerheads are basically the same except for the hand held vs fixed head difference. They are both 1.5 GPM showerheads and they both offer 5 different spray settings.